Making Indian sweets at home could be tricky since most of these require perfect consistency of sugar syrup to obtain perfect texture of sweet dish. While some Indian sweets are little forgiving when it comes to syrup consistency (malpua, rasgulla, gulabjamun etc), the texture of batter/dough needs to be perfect for satisfactory results in such cases. For some sweets, the temperature is a deciding factor while some like laddoo need ‘tagar’, a most crucial ingredient to nail the texture and flavours, made by re crystallizing sugar syrup, by vigorously mixing it off flame, till it turns into a coarse powder. Some desserts need Khoya/mawa and if you don’t trust the quality of commercially available khoya, making it at home is an easy but time consuming process. To cut the long story short, if you have a family who wait in anticipation for a sweet dish to arrive at the end of a meal, you need to think of ‘quick fix’ options to whip up a sweet dish. And ‘Mithi dhabhal’ is one such dessert that you can make in minutes (literally) with readily available ingredients in your kitchen/pantry. You just need bread slices (white/brown), sugar, water and green cardamom. That’s it! !And well, it tastes like Gulabjamun ;-). 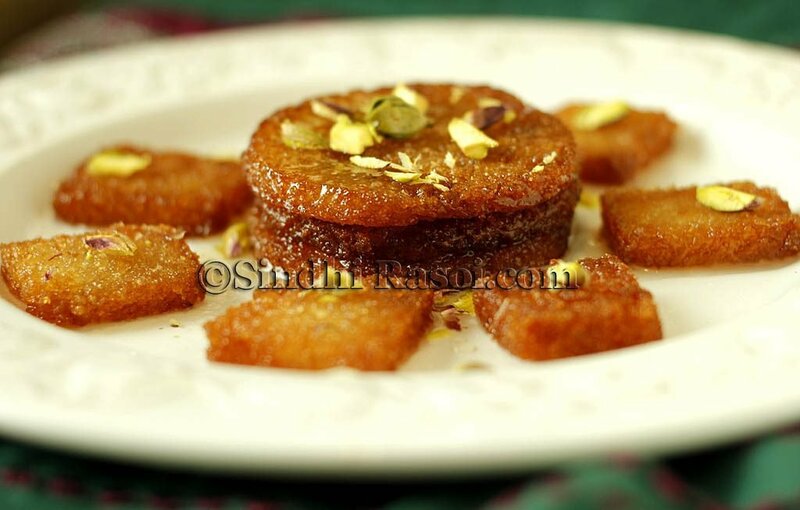 It is one of the most popular sweet made in Sindhi homes. Ps: If you have some leftover gulabjamun syrup then you can use it to soak fried bread. 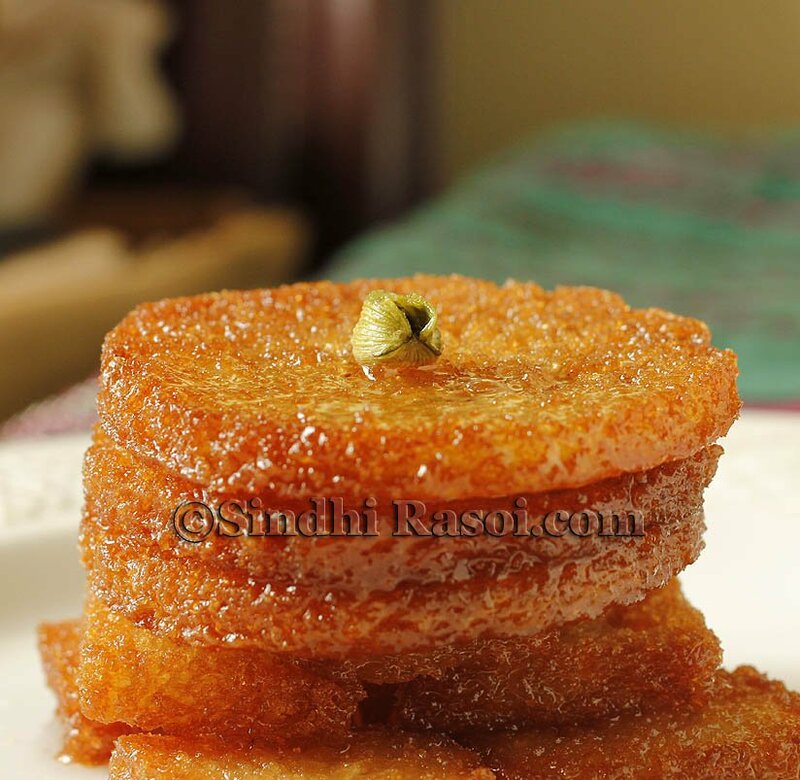 Easiest sweet dish to make, Mithi dhabhal is nothing but deep fried bread soaked in cardamom flavored sugar syrup. Cut bread slices in desired shape. I generally cut each slice in 4 quarters or even disc shape, using a small katori. Heat oil in the pan and deep fry the bread pieces in hot oil on medium flame, till golden brown. Drain on tissue paper. In a pan, mix sugar and water and add slightly crushed cardamom.Let the mixture boil till bubbles appear. The consistency of syrup should be similar to that of Gulabjamun syrup. If using, add saffron too. Put off the flame, and add rose water or essence. Now soak the fried bread in the warm sugar syrup for few minutes and remove them on a serving plate using slotted spoon or fork. If you prefer crisp bread then use less warm syrup and reduce the soaking time.Inversely if you like the bread to have soft gulabjamun like bite, then make sure you dunk your fried bread in tad hot syrup. Could be served warm or cold. Look so yummy and delicious!! I love desserts and this recipe is amazing. Really looking very nice and taste. Thanks for sharing. Do we need to remove the crust of the bread? Your choice!! It tastes good either ways..with or without crust! 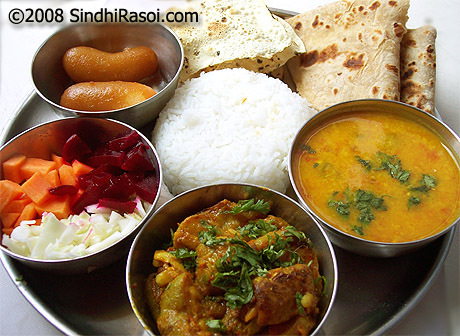 i see your mithi dhabhal sweet bread recipe and after seen water is coming in my mouth, its really looking very nice and tasty. and i think, i will try to make like you. Thanks For Sharing nice recipe. Its looking nice.